Be the first to share your favorite memory, photo or story of Dorothea. This memorial page is dedicated for family, friends and future generations to celebrate the life of their loved one. Beloved Matriarch of the Leder/Gaski family will be much missed and well remembered. Loving Wife for 65 years of the late Henry (Bud) Leder. Loving Mother of Vern (Dolora), Dotty (John) Gaski, Jack (Janet) and Brent (Donna). Loving Grandmother of Vern (Roberta) Leder, Drew Leder, Michelle (Randall) Leder Hugg, Virginia (Shaun) Leder Clark, Kari (Kevin) Gaski Wagner, Brad Gaski and Sue, Kristen (Tim) Gaski Johnson, Brian (Becky) Gaski, Christopher (Becky) Leder, Jeffery (Julie) Leder, Brock (Gina) Leder, Eric Leder and Michaelene, Elliot Leder and Erin. Loving Great-Great Grandmother of Harper and Mila. 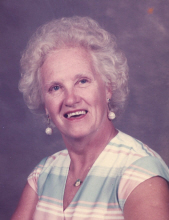 Dorothea dedicated her life to Family, Country, Community and Friends. Dorothea was involved and served with many organizations. She served as: a Founding member of Campfire Girls, a Member of Grace Church choir and Joy Circle, a Den Mother for Cub Scout Pack 142, the President of the Women’s Auxiliary of American Legion Post #335, the President of River Grove School PTA, a Member of River Grove Diamond Jubilee committee, the President of River Grove Senior’s Club, a Member of River Grove Historical Society, a Member of Leyden Township Handicap Commission, a River Grove Fest and Lions Club volunteer, and the President of 9th District Women’s Auxiliary. She was a devoted companion and caretaker of her husband. Visitation for Dorothea will begin at 1:00 pm on Sunday, April 7, 2019 and end at 7:00 pm. at Sax-Tiedemann Funeral Home, 9568 Belmont Ave., Franklin Park. A funeral service will take place at 5:00 pm on Sunday, April 7, 2019 at the funeral home. In Lieu of flowers contributions can be sent to Grace Church 2600 Budd St, River Grove, IL 60171 or the River Grove Food Pantry, 2607 N. Thatcher Avenue, River Grove, Il 60171. "Email Address" would like to share the life celebration of Dorothea C. Leder. Click on the "link" to go to share a favorite memory or leave a condolence message for the family.